Affinity Designer: Can a $25 $49 Vector Editor Really Cut It? Update: Pricing has updated since orginal article was written. Conceptualizing and building a professional design are two very distinct things. In order to build a good design, the artist must feel comfortable with the tools in front of him. For a long time, the industry standard has been the Adobe stack (Photoshop, Illustrator etc). In this article, I will be taking a close look at a modern new alternative to these classics. Affinity Designer is a professional graphic design app for the Mac. It is comparable in many ways to Adobe Illustrator and Sketch app thanks to its vector editing heart. However in contrast to the much busier, classic Adobe Illustrator UI, Affinity employs a clean, modern, intuitive interface, making it easy to learn and very beginner-friendly. A huge upside is Affinity's business model. There is a good trade off between power and price. You can get a license for USD $24.99 $49.95! The UI of the app is very similar to what we see in the Adobe package or Sketch App. It sports a top toolbar, two side toolbars, the working canvas and a thin hint bar at the bottom of the page. It changes the UI so it serves useful tools to work on creating or modifying vector graphics. Pixel persona allows you to edit your vector drawing based on pixels. Tools such as brushes, retouching tools, and pixel selection tools will be available to you. The export persona is used to output entire layers, groups, objects or regions as graphics in your chosen format. Personas make it very easy to find the tools you need. Every time you access a persona the left toolbar changes, offering other functionalities and tools based on the currently active one. The default toolbar keeps the most common tools. Such as: *Buttons – that allow you to switch between standard or retina viewing modes. In the context toolbar, the different options change based on the currently active tool or functionality you have chosen. The dynamic UI makes it very intuitive to find what you are looking for without going in too deep in menus and submenus as you might traditionally expect. The hint bar is located at the bottom of the page. It saves a huge amount of time by providing tips and shortcuts based on the functionalities, tools or options you have hovered your mouse over, or selected. The right sidebar is composed of many useful tabbed panels. In the right sidebar, you can interact with layers, brushes, swatches, colors, effects, styles etc. When the export persona is active the right bar changes with three new tabbed panels. The export settings, the slices panel and the layers tab that gives you options to selectively choose what to export and configure the many export variables presented in the settings panel. If this kind of layout doesn't suit your style of working, you can change it by navigating to Window > Separated Mode. This will detach the UI components from each other, letting you flow them on the screen as you see fit and customizing the panel layout. So you arrange it based on your workflow. This way you can always keep your tools tidy and organized within your reach, and not get lost around. Affinity Designer features a 1,000,000% zoom – Which means that it can handle working on very large documents without losing speed. It is a very useful tool when it comes to working on projects that have a lot of detail and large canvas dimensions. 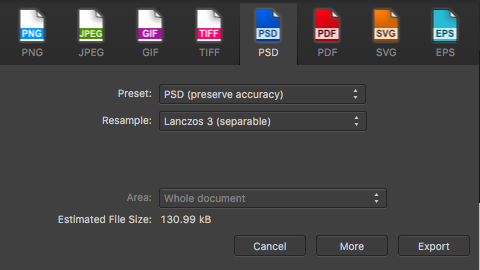 Another huge upside is the ability to import and export projects from Photoshop. For example, if you have designed a mobile app in Photoshop and now you want to continue working on it on Affinity Designer, you can do that with no problem and the whole design will be intact. Same thing vice versa. When you have a mobile app design in Affinity Designer but need to work on it on Photoshop, you can export it very easily. PSD support is a great feature since the industry standard nowadays is Adobe Photoshop. This way you can still work with a team of designers who are not using Affinity Designer. Of course, when we talk about vectors and the web it’s hard to not mention SVG. I’ve read reviews from 2014 that mention that Affinity Designer’s SVG support was a little flaky. Though I’m not familiar with older versions, the current version seems to have very solid support for SVG – though some manual optimization of files destined for the web is probably still in order. Mode mirroring allows you to view two states at the same time. Such as outline/vector view and pixel view at one time, inside one window. Affinity Designer is a very beginner friendly program thanks to its intuitive layout and modern design. 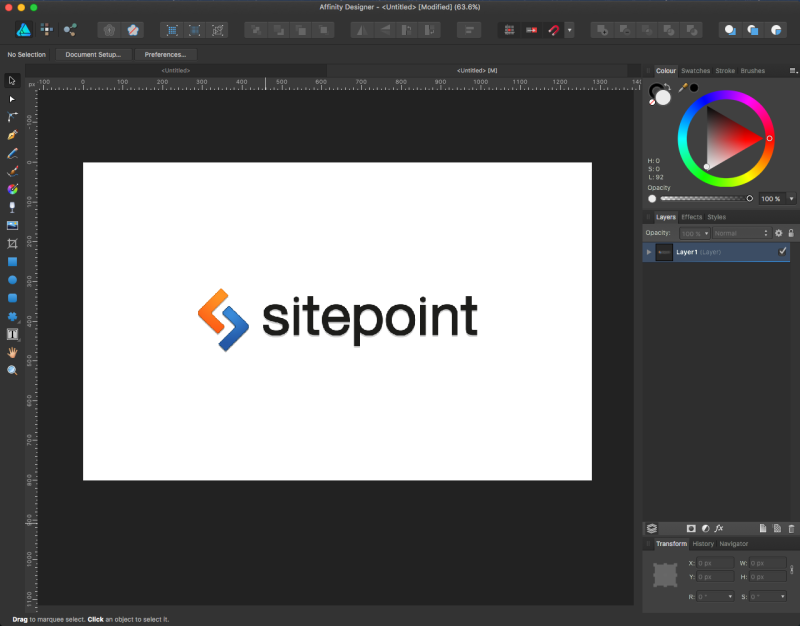 If you already use Photoshop as your go-to design app, you will likely feel at home right away. While you can't truly compare it with industry standards like Photoshop or Illustrator, you can think of Affinity Designer as something that draws together some nice aspects from each, since it offers an extensive set of vector drawing tools with some basic pixel-based manipulation. Could it be a simpler, budget-conscious alternative? Yes, I think it does. Mateo is a student constantly thinking about and building products that may have a positive impact in peoples lives. He gets involved with everything that would help him facilitate the reach of such goals such as programming, design, visual arts and business. Currently his main interests are youth entrepreneurship and tech startups.